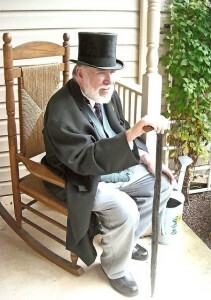 On Saturday, April 9, 2016, Denny Dobry, the 42nd Garrideb and his wife Joann, will be hosting an open house for interested Sherlockians to view his version of Holmes and Watson’s famous sitting room at 221B Baker Street in Reading, PA. 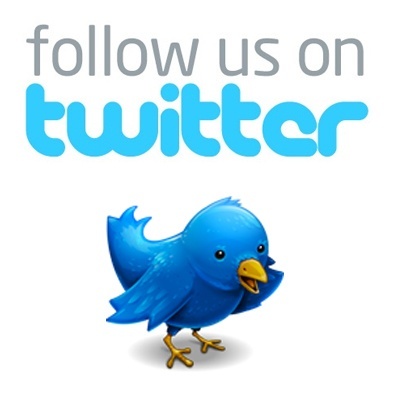 Consider this article a sneak peek to entice you to visit. If interested, please RSVP to Denny HERE. The premise of the ‘Grand Game’ is that Sherlock Holmes and Doctor John Watson were real persons, and that Dr. Watson chronicled their adventures as represented in the Canon. It must therefore be accepted that the flat (apartment) that the detective and his companion occupied also existed. Sherlockian/Holmesian scholars and historians such as T. S. Blakeney, Gavin Brend, William S. Baring-Gould, Vincent Starrett, Ernest H. Short, James Edward Holroyd, Dr. Gray Chandler Briggs and Bernard Davies have failed to identify to everyone’s concurrence the physical location of 221B Baker Street, the address of the Holmes/Watson living quarters as documented in the Canon. Given the good Doctor’s propensity for disguising names and addresses, it is unlikely the actual location of the living quarters will ever be agreed upon. Although we will likely continue to quibble about 221B’s location (Was it actually on Baker Street or elsewhere? 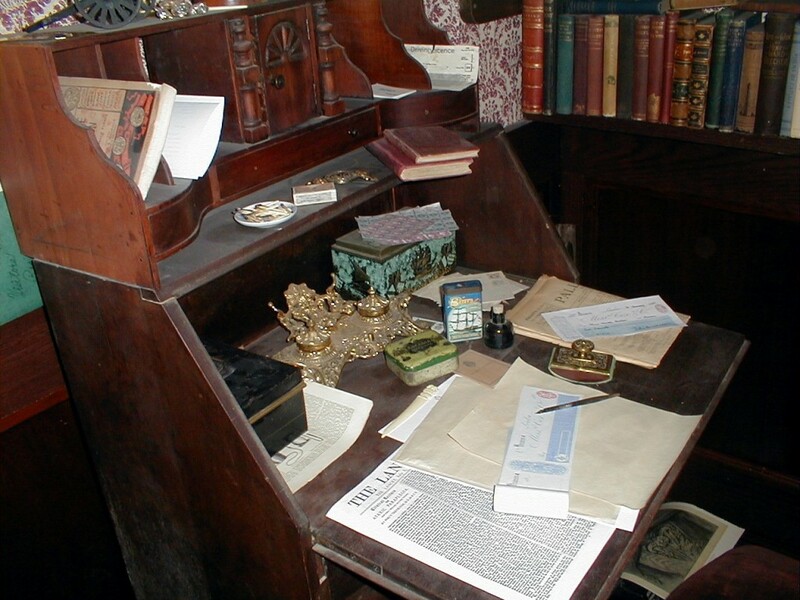 ), Sherlockians would generally agree to the interior appearance of the sitting room and its contents; after all, Dr. Watson was quite descriptive of their surroundings. 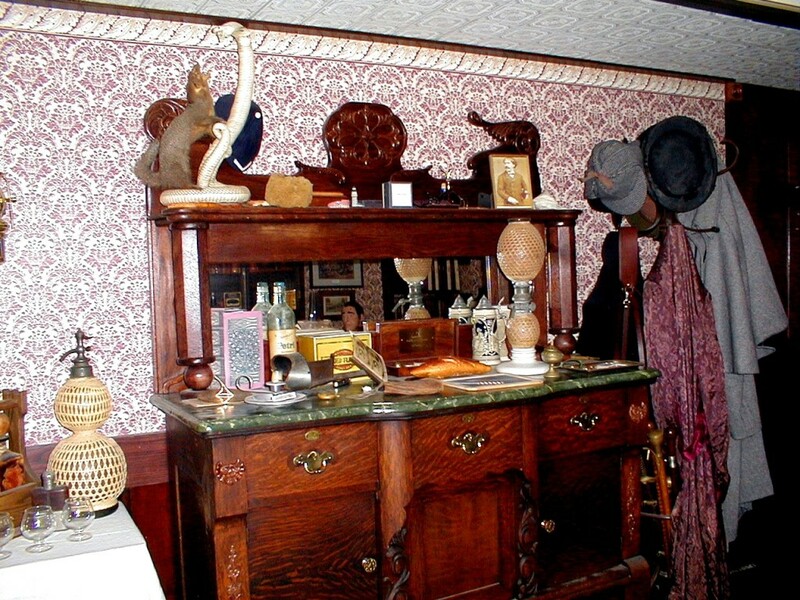 Many Sherlockians have a fascination with collecting and displaying Victorian household items, furniture and artifacts from the Holmes/Watson adventures. One could easily imagine that Christopher Morley owned a gasogene and a Persian slipper. In 1950, noted Holmesian scholar and author, James Edward Holroyd, suggested that the St. Marylebone Public Library in London create a Sherlock Holmes exhibition to be assembled for display during the upcoming Festival of Britain in 1951. Approval from the Borough of St. Marylebone Council was required to allow the library to pursue the project. 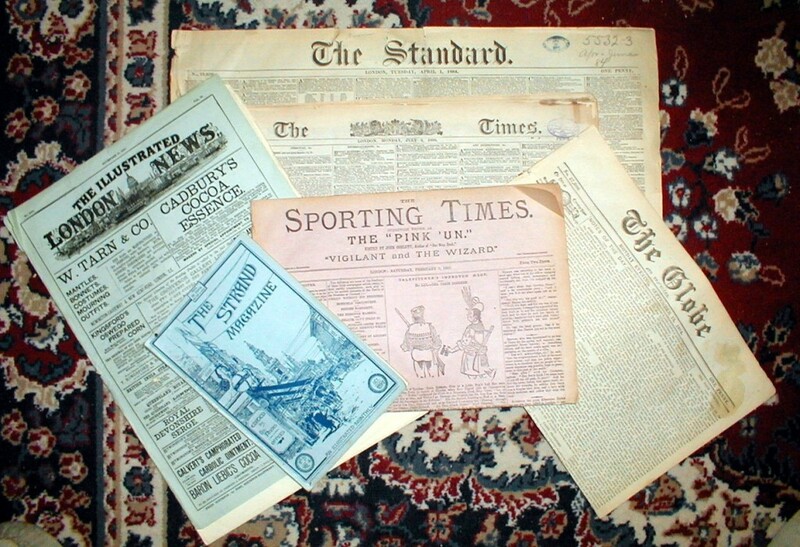 Initially several vocal council members vehemently opposed the idea as being a ‘childish idea.’ London newspapers such as the Daily Graphic, Evening Standard, News Chronicle and The Evening News criticized the councilors for insulting and being ungenerous to ‘the man whose spirit brooded over Baker Street in saturnine splendor.’ The Times newspaper published letters from writers who signed their names Dr. Watson, Inspector Lestrade, Mycroft Holmes and Mrs. Hudson urging the Council to reconsider their decision. Support for the exhibition poured in from many distinguished individuals and groups. The Borough of St. Marylebone Council finally relented to the avalanche of favorable encouragement for the project and added their support to the Sherlock Holmes exhibition effort. The Library Exhibition Committee received offers for support from many quarters. Members of the Sir Arthur Conan Doyle family, the Sidney Paget family and relatives of Dr. Joseph Bell came forward to assist. 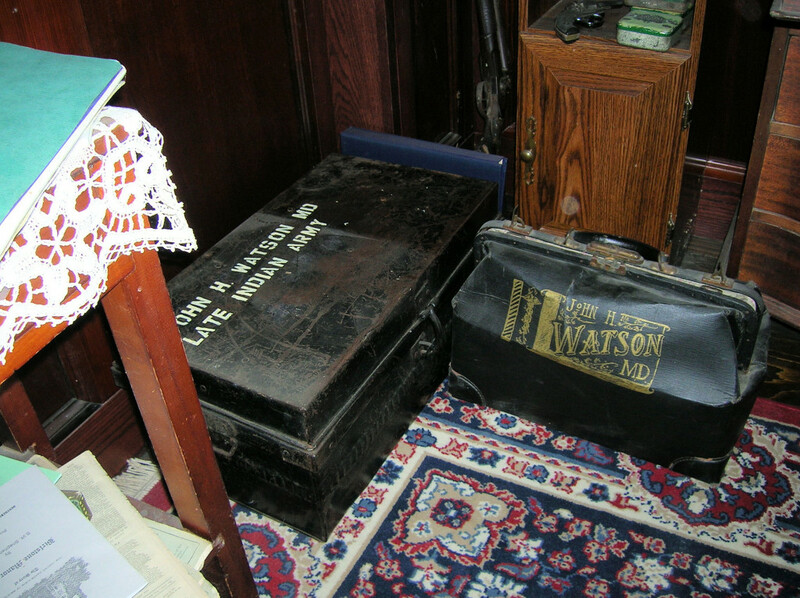 In addition to room furnishings and artifacts, items such movie posters, original Paget drawings, and other Sherlockiana were loaned or given to the Library for display. The Sherlock Holmes Exhibition was assembled on a 1,200 square foot area of the Abbey House on Baker Street and received over 54,000 visitors in four months in 1951. The exhibition gave rise to friendly disagreements about the authenticity of the items in the display, and a number of visitors earnestly claimed to have known Holmes and had had personal dealings with him when he occupied his rooms on Baker Street. After the closing of the Festival, the Sherlock Holmes Exhibition was packed up and toured the United States. In 1957, the Sherlock Holmes Pub opened on Northumberland Street in London in the building that once was the Northumberland Hotel, the hotel that Sir Henry Baskerville patronized in The Hound of the Baskervilles. 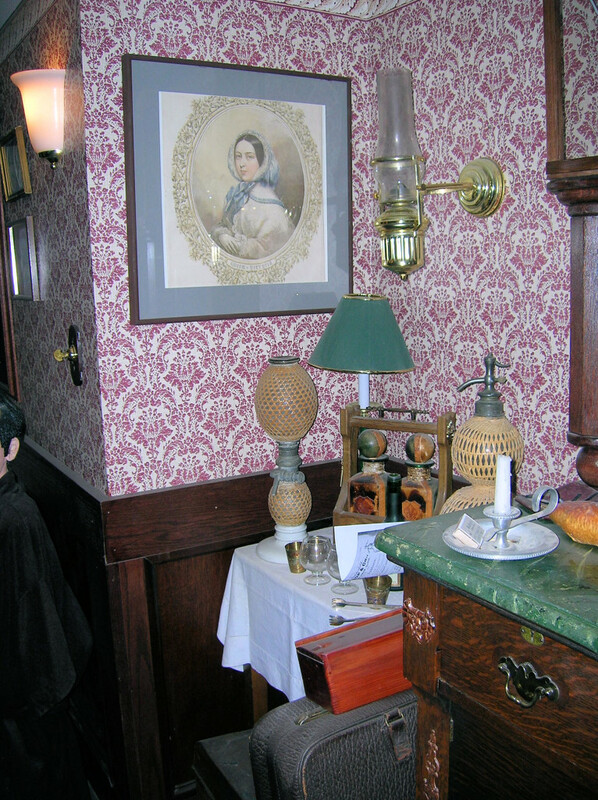 The Pub owners dedicated space for a permanent display of the sitting room recreation using items from Exhibition among others. 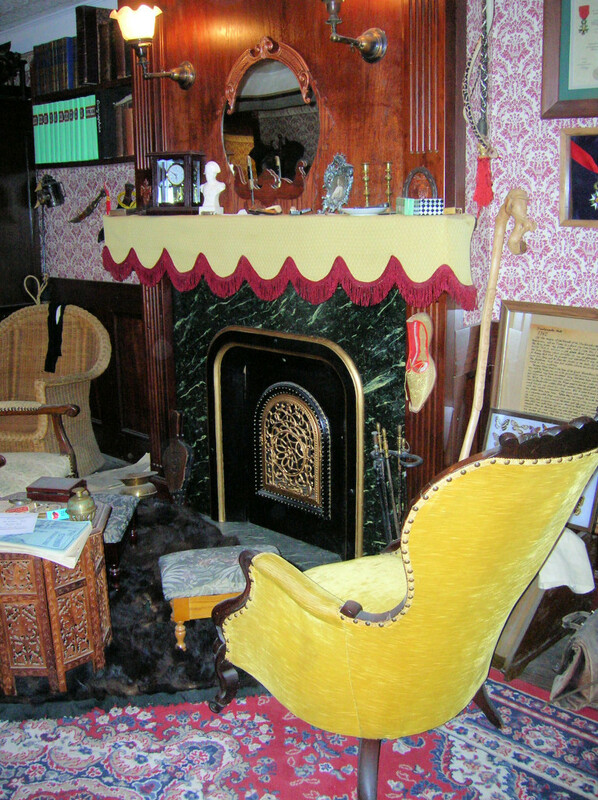 The Sherlock Holmes Festival of Britain Exhibition brought prominent British Holmesians together to plan and create the sitting room replica. The enthusiasm generated by this labor of love resulted in the revival of the previously short-lived Sherlock Holmes Society (1934-1936) as The Sherlock Holmes Society of London. The Society’s first Sherlock Holmes Journal was published in 1952 and continues to this day. In addition to the sitting room recreation at the Sherlock Holmes Pub in London, there are a number of other commercial recreations. 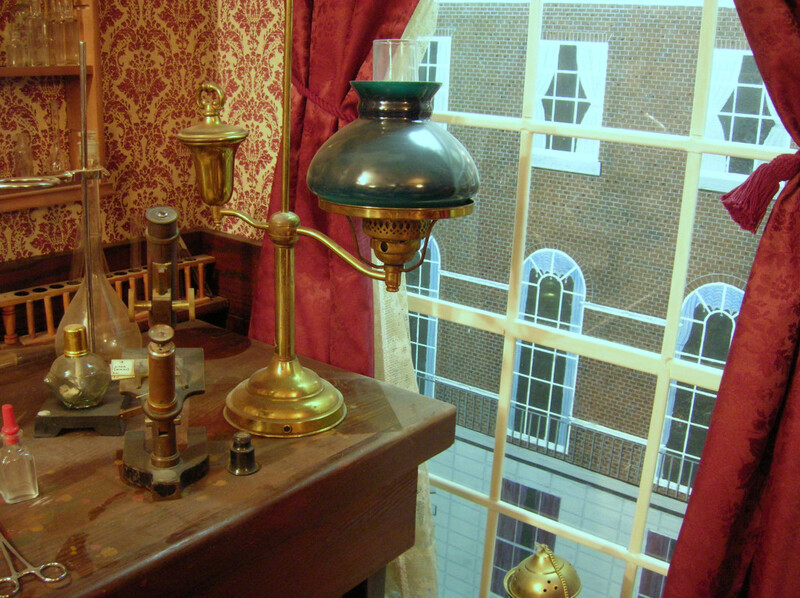 Also in London, the Sherlock Holmes Museum on Baker Street features two complete floors rendered to represent the sitting room, Holmes’ bedroom, Watson’s bedroom and even the loo. Lifelike mannequins recreate characters and scenes from some of the stories. The ground floor contains a gift shop. Two recreations can be found in Switzerland: one in Meiringen, the town near the Reichenbach Falls and the other in Lucens. 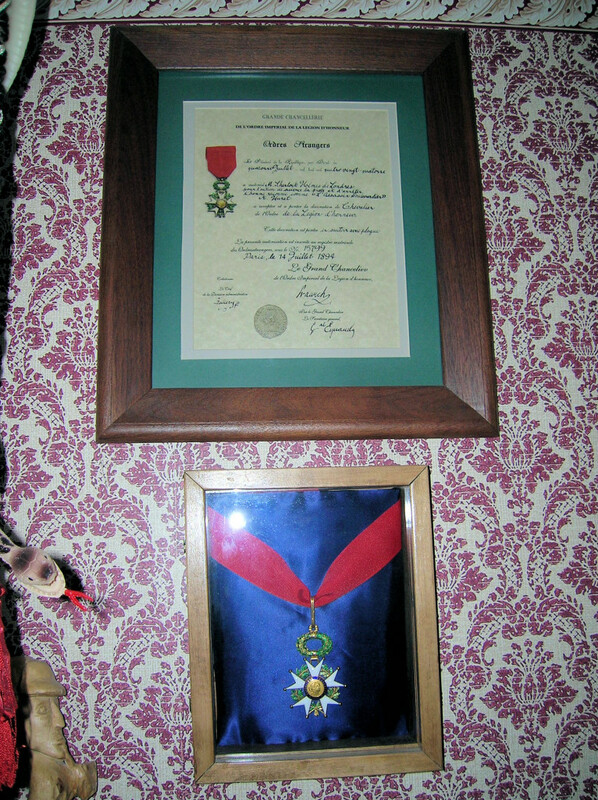 The latter contains artifacts and Doyle family personal items and papers that belonged to Arthur Conan Doyle’s son, Adrian Conan Doyle. There are also sitting room recreations in Denmark and in France. The Festival of Britain Exhibition sitting room replica was one of the earliest publicly created full-scale recreation. The first privately owned and created sitting room replica likely was the work of a 13-year old Sherlock Holmes enthusiast from Cheshire, England. Richard Lancelyn Green (1953-2004) was fixated on the Sherlock Holmes stories from the time he was old enough to read them. Possibly influenced by stories of the Festival of Britain recreation, Richard transformed an attic room in his family’s ancestral home of Poulton Hall into an authentic recreation of the sitting room. Richard scoured junk shops, antique and second hand stores to find artifacts to furnish his recreation. His family members assisted him by providing transportation to shopping areas to look for his treasures. Richard went on to become the youngest member of the Sherlock Holmes Society of London, its president for a time and arguably the world’s foremost authority on the Arthur Conan Doyle works up until his untimely death in March, 2004. For years, Chuck Kovacic of Southern California traveled to various Sherlockian events around the country buying, selling and trading all forms of Sherlockiana. He often kept for himself the most interesting items that he came across and soon amassed an impressive collection of Canonical and Victorian artifacts. 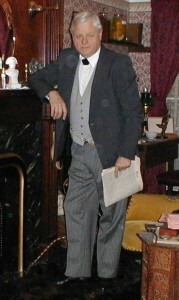 Kovacic’s solution to effectively displaying his collection was to create a full-scale 221b sitting room, and according to Chuck, “ the only full-scale sitting room recreation west of the Mississippi”. To ensure authenticity, Chuck meticulously studied the Canon and heavily researched Victorian styles, customs and items of everyday use. What pattern of wallpaper would have been used? What furniture would be used year round or changed with seasons? 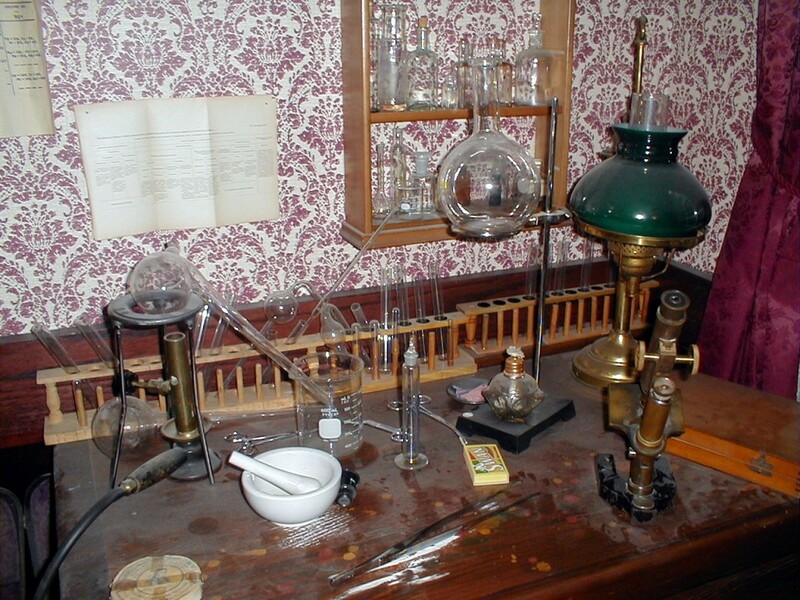 What kind of chemical apparatus would be correct for the period? What the heck is a ‘pannikin’ (HOUN), a ‘life-preserver’ (BERY), a ‘cannula’ (CREE)? Kovacic elevated this tangential branch of Sherlockian scholarship to new heights, independent of the ‘Grand Game’ and based entirely on historical facts. During his travels around the country, Kovacic found other Sherlockians with the passion for recreating authentic replicas of 221B. These kindred spirits began to share their research and discoveries amonst themselves. 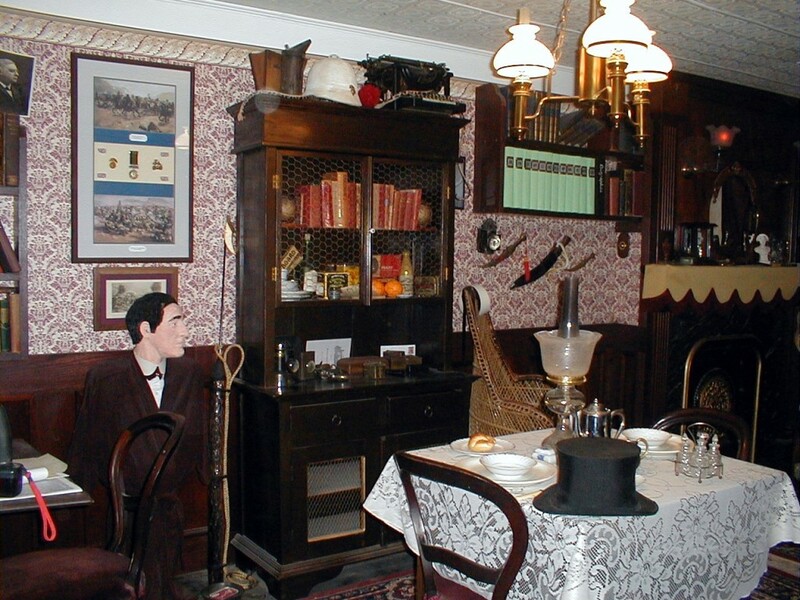 In November of 2000, Kovacic founded The Baker Street Builders (BSB) scion society for those Sherlockians interested in gathering the research necessary to study and/or create the Baker Street townhouse and sitting room of Mr. Sherlock Holmes. 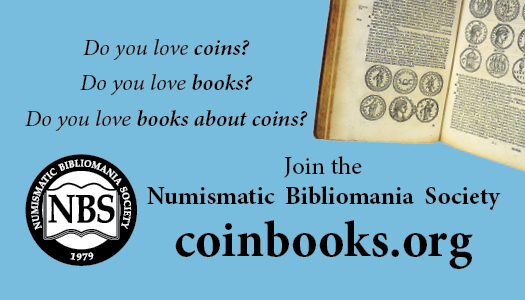 To date a total of 26 membership certificates have been issued, but the number of active members have varied with collections being disassembled or members passing beyond the Reichenbach. Gold lapel pins are presented to those members who have actually built a full-sized recreation. My personal passion for creating a sitting room was kindled on February 27, 1996, when I was introduced to Paul Churchill at his home in Eldersburg, Maryland. 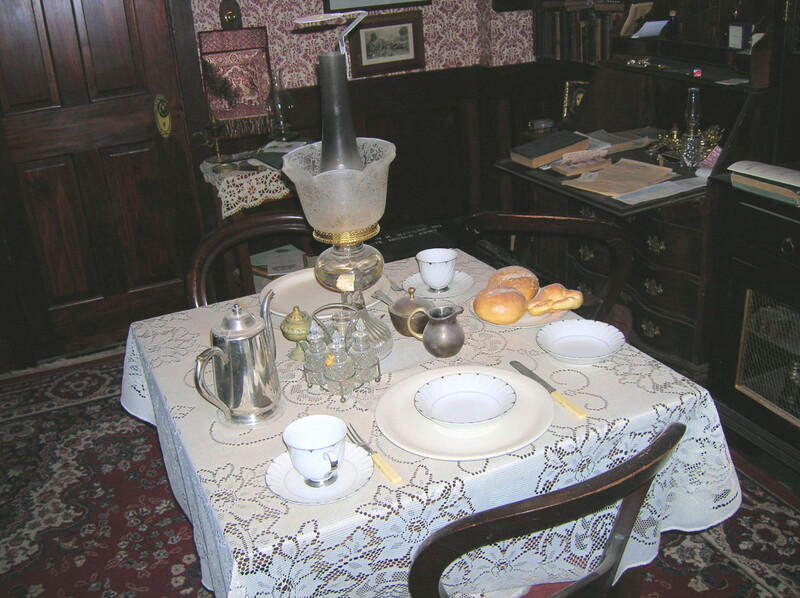 Paul, who later received his investiture into the Baker Street Irregulars as Corot, became one of the first Baker Street Builders having turned his primary living and dining rooms into an authentic replica of 221B. I was in awe at being able to see and touch the canonical items that I had only been able to imagine while reading the stories. From that day until Paul’s untimely death in 2008, Paul and I became close friends, and shared each other’s ideas, creations and little treasures that added to our sitting rooms. 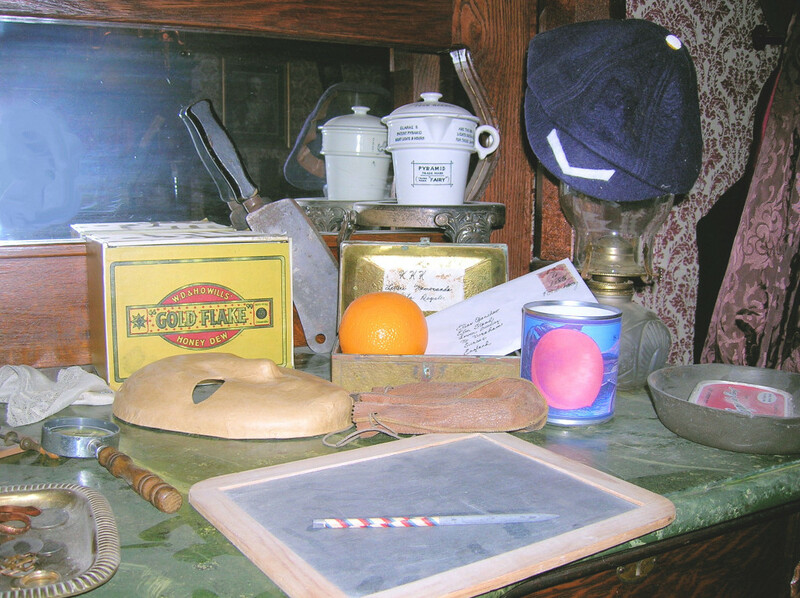 I started to collect artifacts soon after meeting Paul, but my options to siting an actual sitting room where limited. My ‘long-suffering’ wife was anything but keen about converting our small country-styled Cape Cod home into a 19th Century bachelor’s sitting room. However she had no objection to me using our basement for my project as long as I built a large screened-in porch onto our home first. All good marriages are built on compromise. Having been relegated to the basement, I was faced with how to create the impression of a first floor flat (second floor American) when I was two floors too low to start. My solution was to paint a facade of the buildings on Baker Street on the back wall of the basement. Leaving a narrow ‘dead’ space from the facade, I constructed a wall containing the ‘two board windows’ mentioned by Watson in A Study in Scarlet. The illusion worked and coupled with a hidden tape-recorder playing London street sounds, this feature has received the most comments from visitors. Construction of the room’s walls, floor and ceiling took about a year and were completed in late 1999. Furnishing the room and adding artifacts continue to this day, as new or better artifacts are discovered. Antique stores and eBay have been the most productive sources for finding relevant items. When an item or document can’t be found, a little ingenuity in crafting skills or Photoshop can usually bring satisfactory results. Before his passing, Paul Churchill and I exchanged many ideas and creations between us. Paul was a talented artist and I possessed some crafting skills, and we shared each other’s creations. The Canon of course provided the ‘shopping list’ of items that were coveted. Stephen Clarkson’s The Canonical Compendium published in 1999 listed all of the physical items mentioned in the Canon in addition to character names and places, and became a valuable research resource. The sitting room contains a least one artifact from each of the 60 Canonical stories and some stories have numerous representative items. Some of the more interesting items include: a Weiss & Company cataract knife (SILV), a gasogene and a seltzogene (most often Sherlockians erroneously refer to a seltzogene as a gasogene) (MAZA, SCAN), a dark lantern (REDH, BRUC, CHAS), a set of burglars’ tools (BRUC), a black and white ivory box (DYIN), a tin of Arcadia Tobacco (CROO), a gold watch with a sovereign as a watch fob (SCAN), and a bust of Holmes with a bullet hole through the head (EMPT). If you cannot attend during the Open House, visitors to the sitting room are welcome by appointment. Although it was great fun building and furnishing the room, my joy now comes when I can share it with fellow Sherlockians. Contact information and additional photographs can be found at Dobry’s Facebook page. Denny Dobry, the Gasogene of the White Rose Irregulars (PA) is active with the John H Watson Society, Six Napoleons of Baltimore, Watson’s Tin Box. Denny can be found looking for items for his sitting room at yard sales, flea markets and antique malls.